We make your dreams reality! 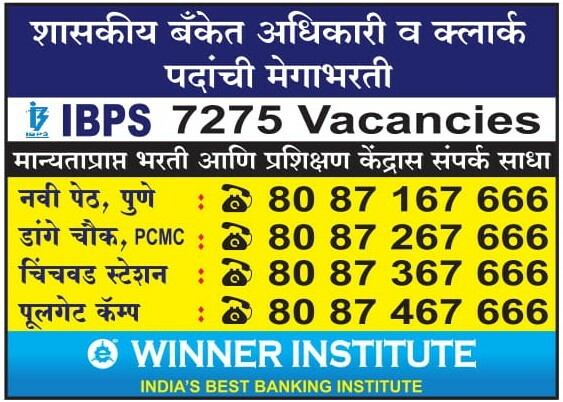 Winner Institute of Competitive Exams is the best banking classes in Pune for preparation of all banking examinations. In Winner Institute Banking aspirants will get a chance to learn from the Experienced Bankers. We provide a wide range of courses and programs as a result of the continuous effort to meet the needs of banking as well as all types of competitive exams and to improve your personality on the whole. 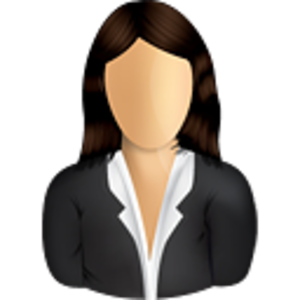 These courses are designed in a manner that systematically equip them with the knowledge and techniques required for any exam and help them in their career progress. 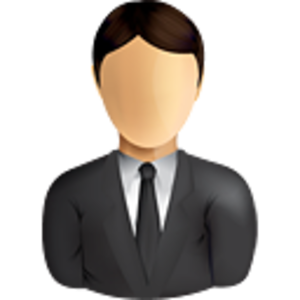 We are different than other Institutes in India as we offer valuable career education to achieve the successful career path with IBPS Probationary Officer (PO) exam, Common Written Examination (CWE), SBI Probationary Officer (PO), Clerk. WE DON’T.. OUR RESULT SPEAKS FOR US.. Till now we have successfully guided around 5091 Students to get the job in Various reputed institutions like SBI, RBI, IBPS recruitment, LIC, NABARD, Staff Selection Commission, National Insurance, etc. When you choose Winner Institute of Competitive Examination (WICE) as your perfect guide to success, you will discover what so many successful officers have already discovered – The Power for certainty. We deliver quality education and nurture the skills, attributes and qualities in your personalities which are most essential part of our programme to improve your personality and reach your career goals successfully. We are with you, until you get your desired job. This class will certainly orient you as your friend, Philosopher and Guide on your path to success. Winner Institute of Competitive Exams provides proper guidance and comprehensive preparation for IBPS PO, Clerk, SO, SBI PO/Clerk Prelims and Mains, RRB, RBI and other banking job-related recruitment exams. Winner Institute of Competitive Exams is the best institute for SSC COMBINED GRADUATE LEVEL EXAMINATION. 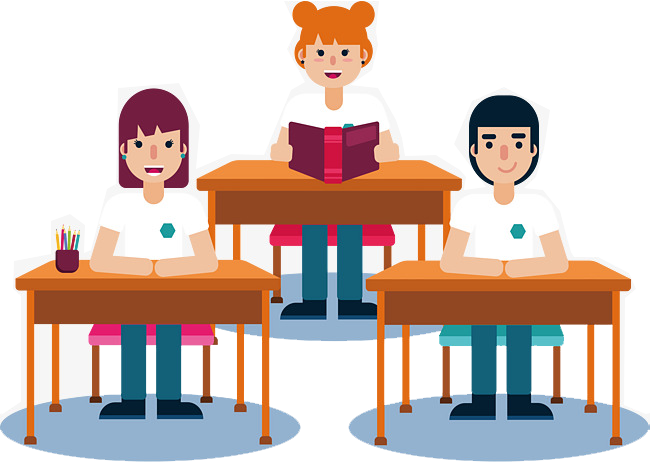 We provide proper guidance and comprehensive preparation for exams. The Common Admission Test (CAT) is an all-India test conducted by the IIMs as an entrance exam for admission to the Post-graduate and Fellow Programs in management courses of several management institutes all over India including the IIMs. Satyaki Abhyasika is a biggest Abhyasika (study room) in Maharastra. Satyaki means ‘Rider of your education Chariot’. Satyaki is for the benefit of hardworking students. This is based on “no profit & no loss” for students of banking, MPSC, UPSC, CAT etc. 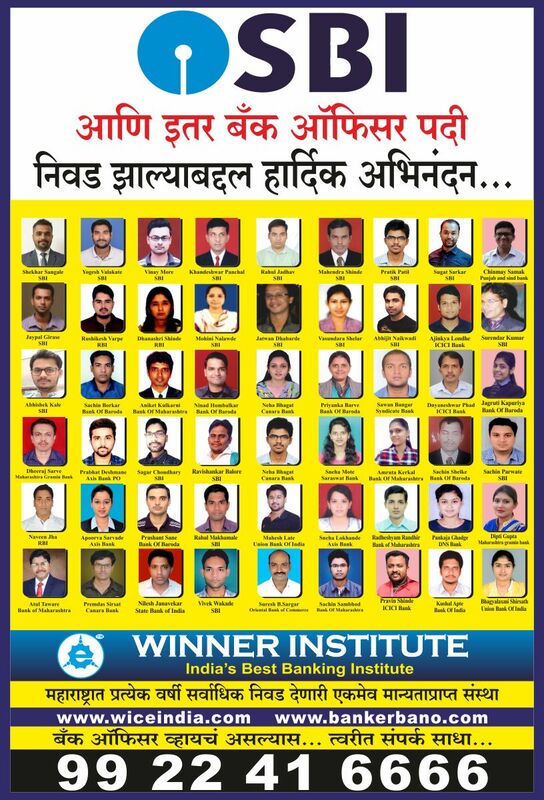 winner institute is the best institute for banking and other competitive examination. best teaching faculty, and staff are also very cooperative. best classroom facility are provided here with computer lab and library is also there. Abhay Sir and Saurabh Sir for being a great inspiration to us. One of the finest classes for banking, in Pune. Cooperative faculties, well maintained infrastructure, library facility. I met one of the ak time best GK teacher in the same class, Saurabh Sonawane sir. He not only improved understanding about GK, but helped in personality development. His Questions Prediction skills are really awesome. It really helped a lot in cracking exam. This class brings you a new, path- breaking and scientifically proven methodology of logical and analytical approach. This will certainly boost your confidence level and enhance your qualities and attributes, which are the key points to get success in any competitive examination. In Winner Institute of Competitive Examination (WICE) we ensure you that with your dedicated hard work and our guidance and teaching, you will definitely succeed in this era of competition with flying colors. You will definitely be a ” WINNER “. Address: Poolgate Camp Branch Office, In Front of Poolgate Bus Depot, Winner Plaza, Pune-411001.